This is a really fun game to play as you will get to open a clothes shop inside a very busy mall. There you will have many creational choices, meaning that you can imagine and then create lots of different clothes. Pick up the materials you need for them, then hand them to the seamstress and give her the instructions she needs to turn that piece of cloth into a true work of art. This is an online game so you can show others what you have created and maybe they will buy it. If you also find clothes that you like you can post them out for sale and others will probably buy them if they are not overpriced. Use the mouse to play this girl game. 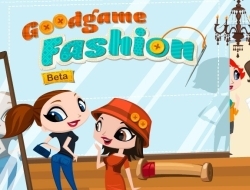 Goodgame Fashion 6.80 between 0 and 10 based on 5 votes.